Sri Sankaracarya was a great philosopher, a prolific writer and a true devotee of God. The Upadesasahasri is a famous treatise on Advaita Vedanta and also known as the Master piece of Sri Sankara. The text is named so, because it contains thousand advices of the great Advaita philosopher, i.e. Sri Sankaracarya. The book is divided into two parts, prose (gadya) and poetry (padya). The prose part has three chapters and poetry part has nineteen chapters. The work vividly describes and also established the non-dualistic approach of Sri Sankarain a lucid way. Its language is very simple and easily accessible, The poetry part manly deals with various concepts of Vedanta, Brahman, Atman, Maya, Srsti (Creation), Jiva, Moksa, etc. The prose part is in the form of a dialogue between a teacher and his disciple, where in the teacher and hi disciple, where in the teacher and his disciple, where in the teacher satisfies the student by answering all his doubts. 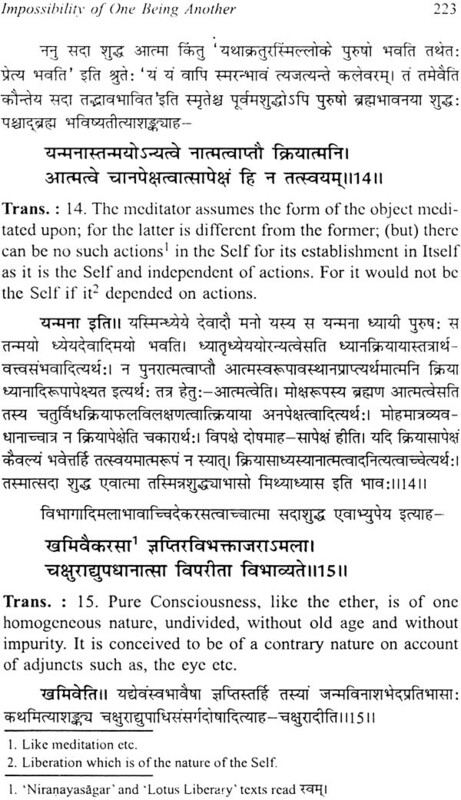 The present volume contains the original Sanskrit text along with the commentary of Sri Ramatirtha. 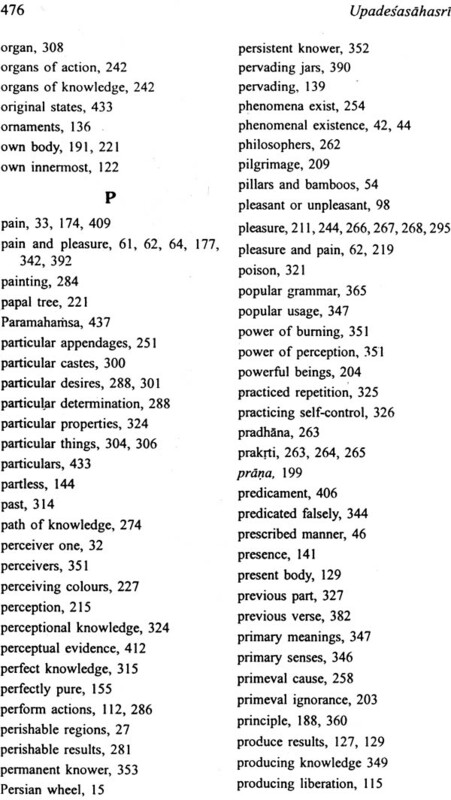 Besides, the English translation is also ornamented with an index. The students of Indian Philosophy will be benefited by this excellent scholarly work. However, the work will definitely show a new light in a positive direction to the researchers and true lovers of Advaita Vedanta. Dr Narasingha Charan Panda, Reader in Sanskrit, Panjab University, Vishveshvaranand Vishva Bandhu Institute of Sanskrit and Indological Studies, Hoshiarpur, is well-known among the scholars of Indology as a sincere and devoted researcher, who combines in him a comprehensive understanding of scholarly issues, impartial judgment and an exemplary clarity of expression. After graduating from Utkal University and Post-graduation and M. Phil. degrees from Kurukshetra University, he obtained Ph. D degree in Vedic studies from Panjab University, Chandigarh and thus specialized himself in different Indological branches, like the Vedic studies, Buddhism and Kashmir saivis,. In due course of time, he has qualified himself with Acharya in Buddhism, Acharya in Darsana Sastr, C.C. in German Language and Ayruveda Ratna. Dr. Panda is the joint editor of the ‘Kalatattvakosa’ and the ‘Glossary of key Art Terms’ of Indira Gandhi National centre for the Arts. As an ardent student and a successful researcher of Indology he has contributed numerous learned research papers and edited some valuable works to his credit. 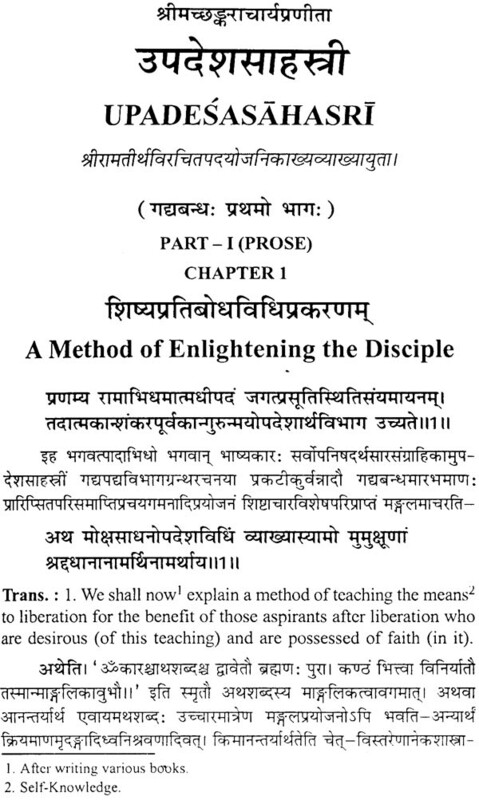 Upadesasahasri written by Sri Sankara, the great Teacher, is translated into English with explanatory footnotes which will be found useful by readers while going through the book. References to Upanishads, the Vedanta Aphorisms and the Bhagavad-Gita mostly quoted by the author have been carefully traced and shown at the bottom of the pages, which, it is presumed, will throw much clear light on the Text and solve difficulties. In his eagerness to do good to people the great author, while writing the book, has spared no pains in making clear the idea of the distinction between oneself and one’s body, mind, etc. 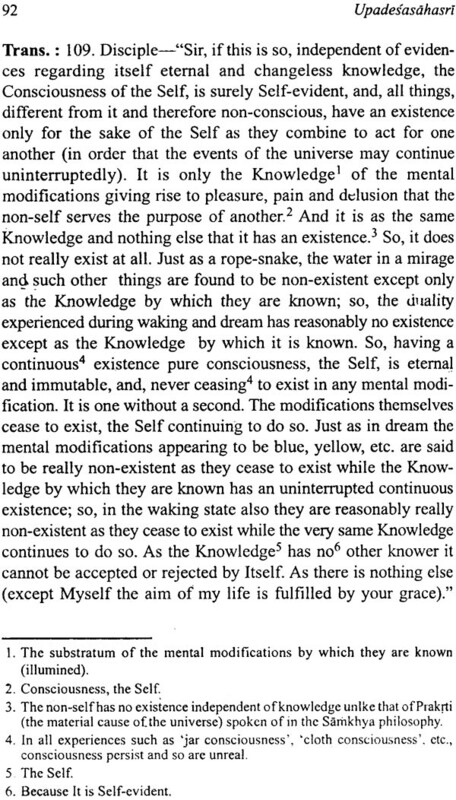 which, when rightly comprehended under the benevolent guidance of a teacher, a man of knowledge, will perfectly convince one that one is not other than the Unlimited Bliss untouched by hunger and thirst , grief and delusion, old age and death, the only real Existence, the goal of all human beings to be realized in life. Ramatirtha’s glossary on Sankara’s Upadesasahasri has been followed in translating the book and appending footnotes. 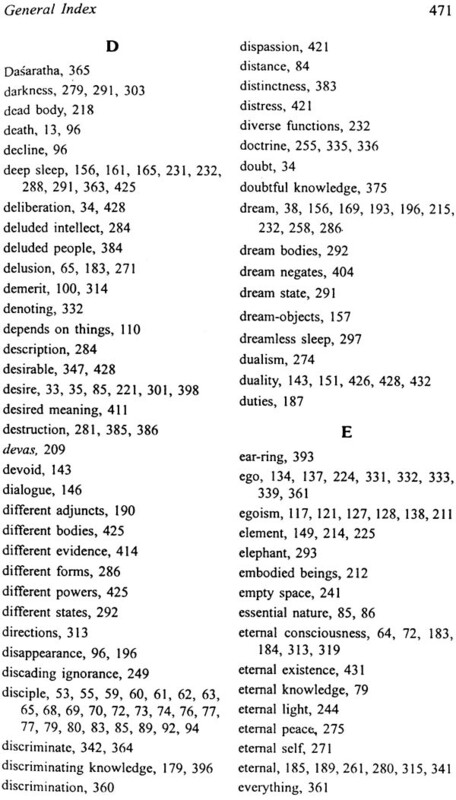 Certain words not to be found in the text but necessary for making the meaning clear have very often been placed within brackets. Explanatory paragraphs have been added to he translation in a few places. In studying he book one begin either with the prose part or the metrical. We have adopted the most acceptable readings after consulting the Nirnayasagar, Lotus Liberty and Mysore editions of the book. 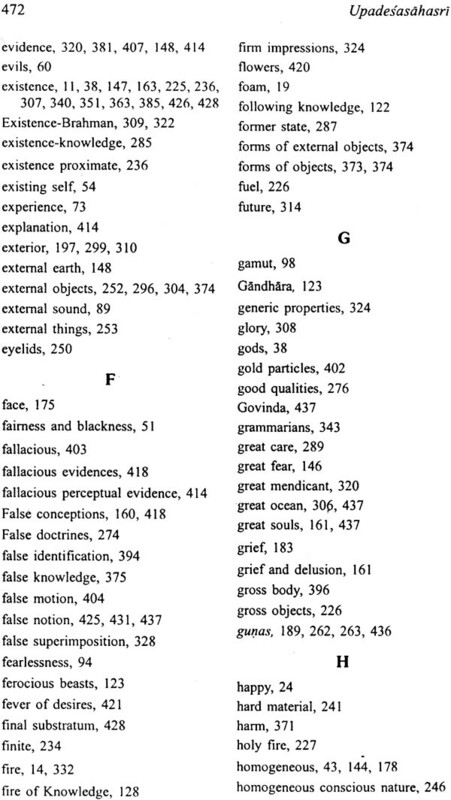 An index to the verses is appended at the end of the book. It will, it is hoped, be found useful. Acharya Sankara was a great philosopher, a prolific writer and a true devotee of God. He is believed t be the incarnation of Lord Siva. Even these who cannot follow his doctrines do not fail to recognize his greatness. Therefore, it is necessary to systematize his ideal teachings to make his noble thoughts accessible to common readers of Vedanta Philosophy. It is regarded as almost certain that he was born between 700 and 800 A.D> Sankara’s father was Sivaguru and his mother Aryamba. Sivaguru was Uajurvedi Brahmin of Taittiriya Sakha (branch). This pious couple of the Namudri caste lived in Kaladi, a quite village on the bank of the river churna or Pruna in Kerala. The Nambudri Brahmins of Kerala are highly cultured and deeply religious. Sivaguru and his wife, were, in the best traditions of the caste, learned, virtuous, wealthy, kind-hearted, humble and liberal. Due to the grace of Lord Siva Acharya Sankara was born as a son of Sivaguru. It means, when he was eight years old he had achieved mastery over four Veda’s; at twelve he had the knowledge of all the sastras; by the time he was sixteen years old he has written his renowned commentary on the Brahma Sutras; and at thirty two he became a muni and then departed from this world. It is also said that when Sri Sankara was about to complete his eight years some powerful sages arrived at h is house. Sankara’s mother received them with all due courtesy and reverence. The sage were deeply pleased with the treatment they got and greatly impressed with the sharp wisdom and devoutness of her illustrious son about when they knew everything because of their yogic insight. The sages to led Aryamba that her son Sankara had come to this world to fulfil a divine mission and although initially he was destined to live only eight years span would now be doubled. Aryamba knew that the Lord had placed this alternative before her when he had answered her humble prayer for a child. But it was only now that she realized that it was the one chosen. Nevertheless she was distraught with grief to know that her son would die early. Sankara comforted her. The coming together of people, he said was like the brief meeting of travelers. Every soul (human being) was on its worldly journey on its own, and the association of relations like father and son, brother and sister, were of a temporary in nature. So no one should be disappointed for the short time relationship in this materialistic world. Sri Sankara was remarkably intelligent, and at an age when boys are just toddling along he had got acquainted with a number of languages. According to Madhaviya Sankaravijaya: ‘in his first year he (Sankara) learn t the Sanskrit alphabet, when he was two years old he could read books in his mother tongue, and at three he could understand the Kavyas and Puranas’. 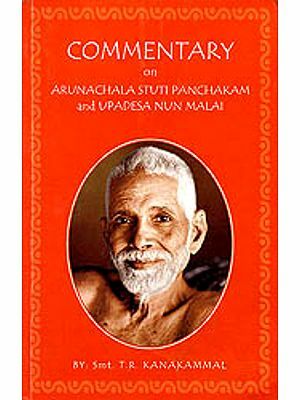 After he passed his eighth years, he was proficient in all India literature, i.e., sastras and than he had started to perceive the unity of absolute existence on which the philosophy of Advaita School is based. Not heeding the protests of his parents, he got himself initiated as an ascetic by Guru Govinda Bhagatpada. Prior to this Guruji too, was aware of his, coming, and knew by his yogic insight that Sankara was Lord Siva’s incarnation and that god had sent him to be instructed the Philosophy of Advaita Vedanta. As soon as Snkara came in search of guru and entered the cave, Bhagavatpada saw him, and was impressed with the saintly appearance of the divine boy sage. He gladly accepted as a disciple. Govinda’s own guru, the venerable Acharya Gaudapada had instructed him in the advaitic teachings was contained in the Brahma Sitras. He now initiated the gifted disciple into these truths and those contained in the Upanisads. Sankara remained their some moths, humbly attending on his guru and imbibing his ideal teachings. The teacher Govindapada was greatly impressed and advised Sankara to go to Varanasi and pay his homage to the sacred shrine of Lord Visvanatha. Then Sankara took his guru’s kind blessings and set out for this renowned religious city. On arriving at Kashi, Sankara took up his abode at the Manikarnika ghat, and became absorbed implying his homage to the sacred shrines of Lord Visvanatha and Mata Arnapurna. His fame spread far and wide and a number of disciples flocked to him to be instructed in Advaita Vedanta. Then, Sankara soon began to wander through the other traditional cities of India with a group of devout the other traditional cities of India with a group of devout pupils preaching h is new doctrines. He founded four great spiritual centres of religion, i.e. mathas at the four cardinal points in India. These pithas are established for the propagation of his tenets and to this day these centres are held in veneration. These mathas or pithas are: (1) the Jyotirmatha near Badrinatha on the Himalayas at the North; (2) Saradamatha at Dwarkapuri at the extreme west of the Indian peninsula; (#) Govardhanamatha at Jagannatha Puri, Orissa, on the east coast; (4) Smgerimatha in Mysore near Tungabhadra river in the South. These famous spiritual cnetres are still places of pilgrimages, and are annually visited by thousands of devotees from all over India. 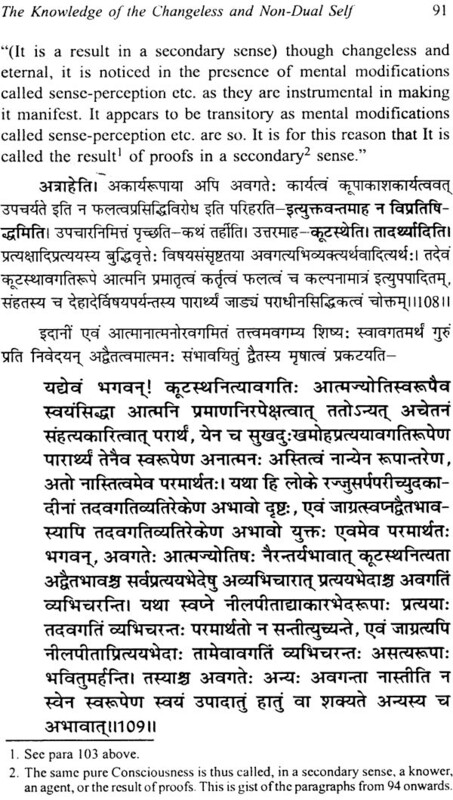 In ordr to spread the doctrine of Advaita Vedanta, Sankaracarya had written a number of word containing its essential teachings. 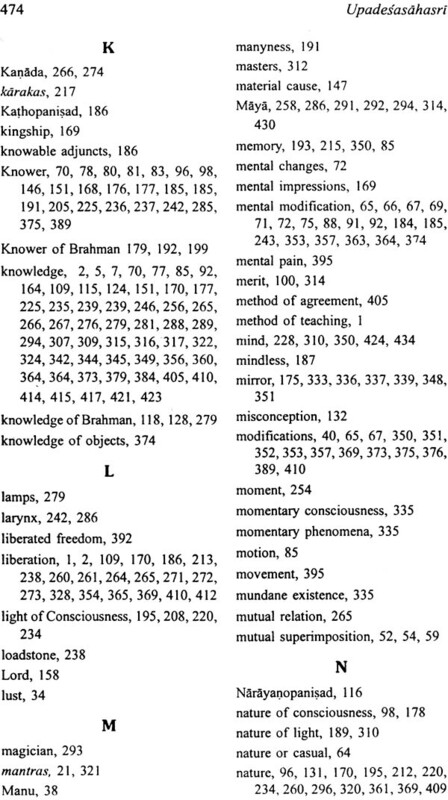 These works both in Sanskrit prose and verse give the advaitic view points on the main concepts of Vedanta, e.g., Brahman, Atman, the soul, which the Vedantists believe to be identical in nature the delusive nature of the world, the role of maya incasing this delusion, qualifications needed to read vednata, Philosophy the attainment of liberation, which is the chief objective of the VEdantic quest, and so forth. These works really prove the high intellect of Sankara and also establish his vedantic thoughts and ideology. 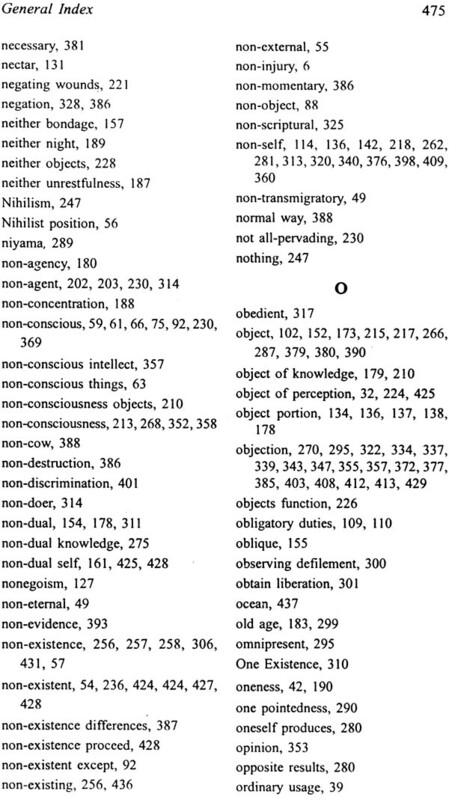 Besides, in a way these works are the most important and significant of Sankara’s writings inasmuch as they are not mere interpretations of other treatises, as in case of his commentaries, but directly gives his views on many important concepts of the Advaita Vednata. 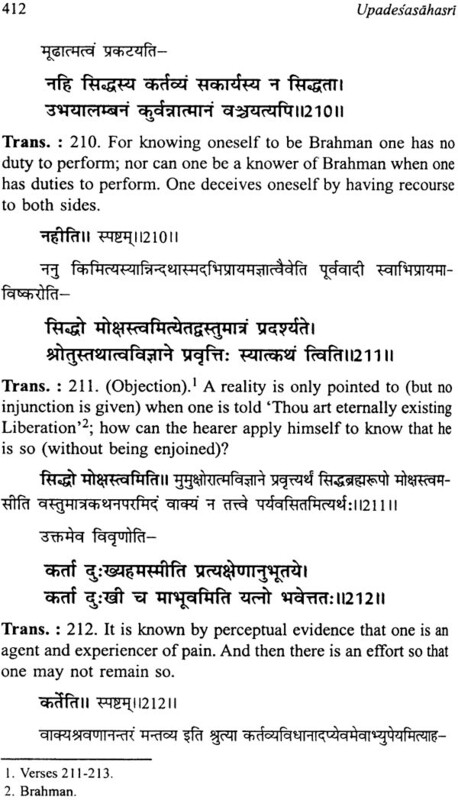 Sankaracarya had written a number of commentaries of on various treatises. The Brahma Sutra, Bhagavad Gita and Upanisads are known as prasthanatayi on which the Vedanta is based. Sankara wrote his commentaries on the Brahma Sutra, Gita and major Upanisads, viz. 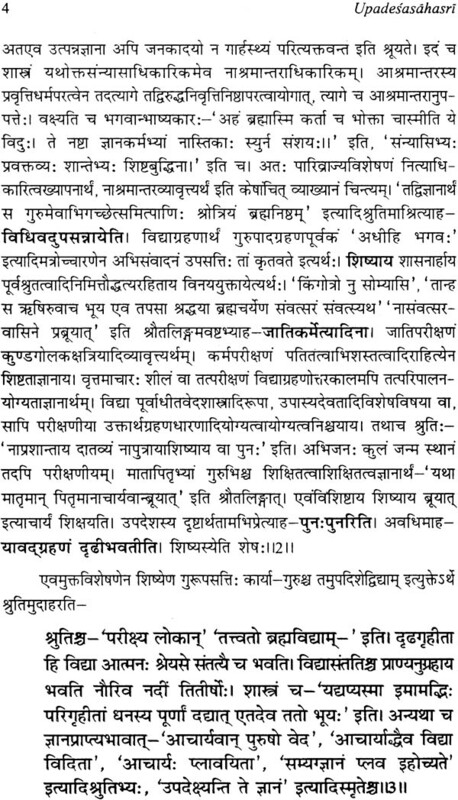 In addition to these commentaries on Upanisads, some there commentaries are also available, which contain the name of Sankaracarya, as its commentator, viz, Svetasvatara Upanisad, Nrsimha Purvatapaniya Upanisad, etc. 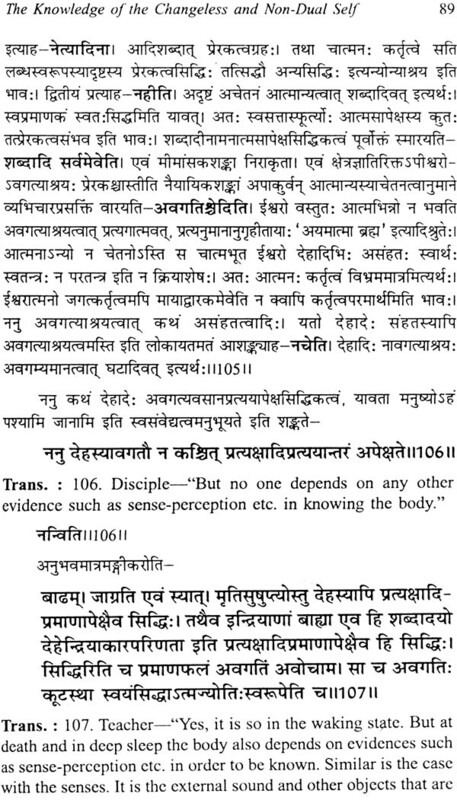 However, Sankaracrya’s Upanisad commentaries have the same measure of excellence in expression as are founding his other works. 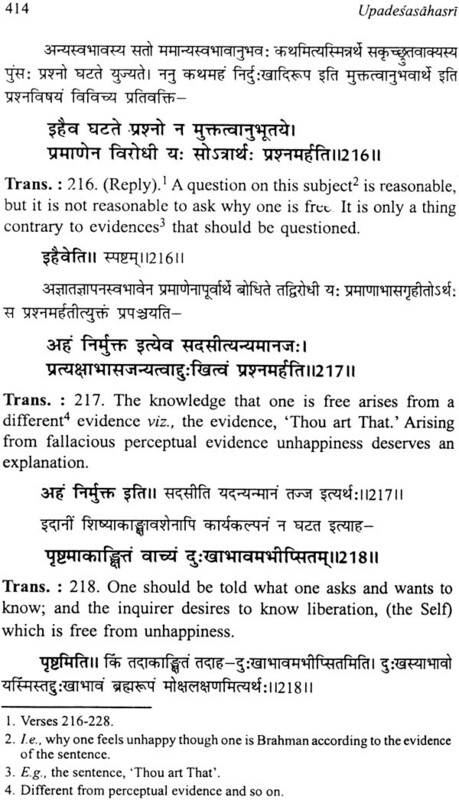 They contain examples and illustrations from various vedantic texts in support of his view point as well as weighty arguments agains contrary beliefs. 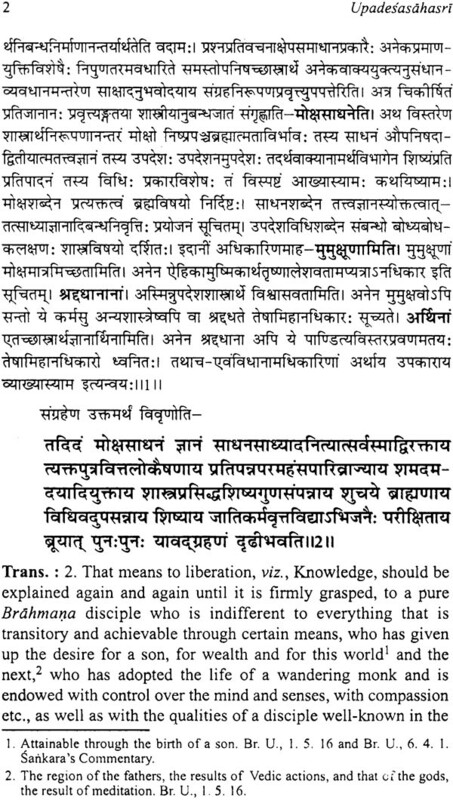 Sankaracarya describes the Bhagavad Gita as the quintessence of teaching of the entire veda (Samasta vedartha sarasamgraha bhutam). Te third of the canonical texts is the Brahma Sutra, which is regarded as Nyaya-prasthana, because it sets for the teachings of Vedanta in the logical order. 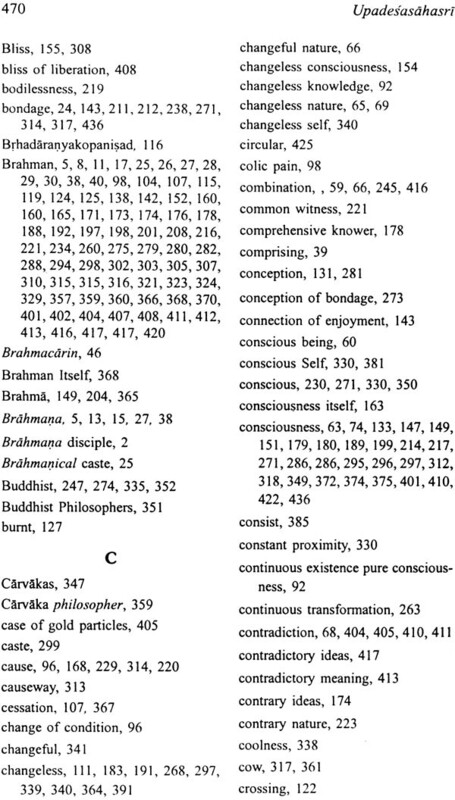 The Brahma sutra is also known as Vedanta Sutra or Sariraka Bhasya. 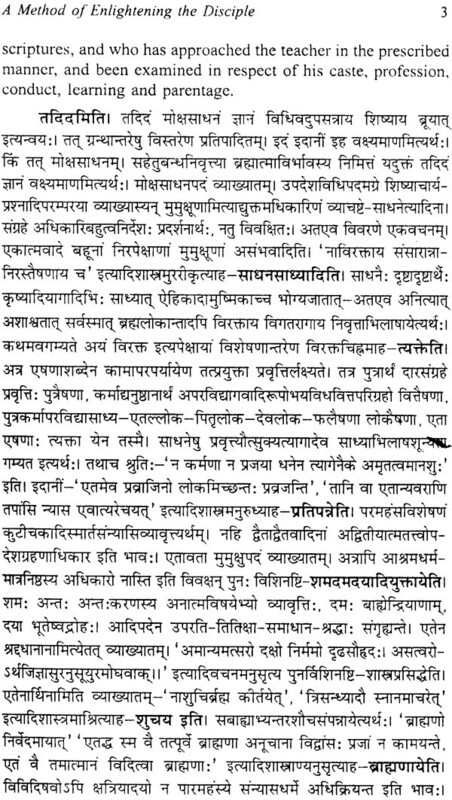 A study of the extent commentaries on the Brahma Sutras of Badarayana by the adherents of different schools of thought leaves us convinced that these sutras were regarded by all as condensations of the teachings of the Upaninsads. 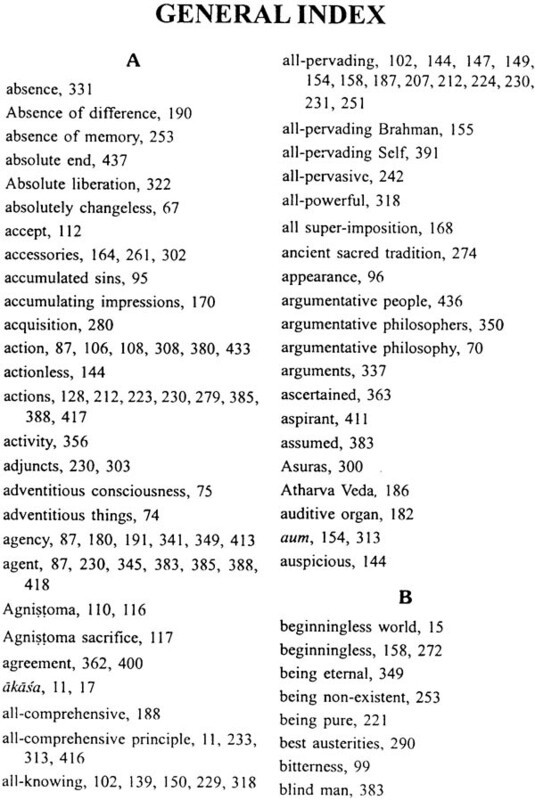 (1) Atmabodha, (2) Aparoksanubhuti, (3) Advaitanubhuti, (4) Upandesasahasri, (5) Viveka Cudamani (6) Vakyavrtti, (7) Pancikaranam, (8) Prabodhasudhakara, (9) Laghu vakya vrtti, (10) Yogatarvali, (11) Saundaryalahari, (12) Svatmanirupana, (13) Mohamudgara, and (14) Prapancasara Tantra. (2) Sri Sankara is perhaps the only one, or one among the very few ancient India Philosophers centring whom so many biographies of legendary nature have rise. It is these biographies that happen to be the basic-source materialsot know the life of Sankaracarya. Besides these, there are also numerous small stotras composed by different Advaita teachers like Totakastaka of Totakacarya, the Gurvastaka of Citsukhacary,all singing the glory of Sankaracarya. 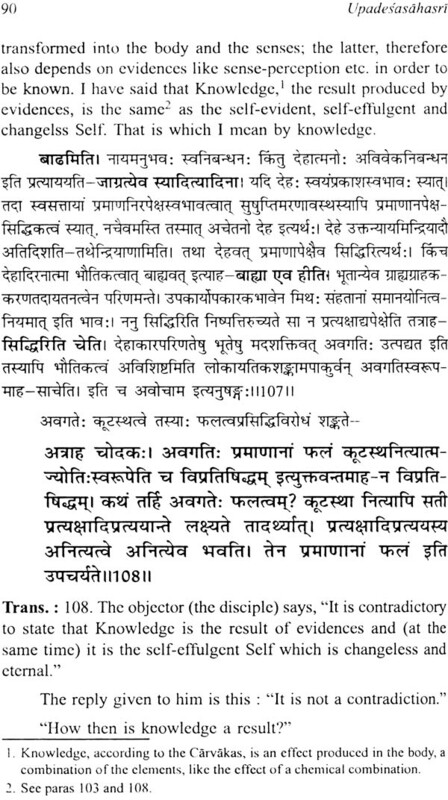 There are also other small verses, found in the works of Suresvaracarya, padmapadacarya, Vacaspati Misra and at other great Advaita writers praising the glory of Sri Sankar. Moreover, the biographers, attribute some supernatural powers and miracles to the Acarya Sankara.